Missing all your favorite vendor offerings? 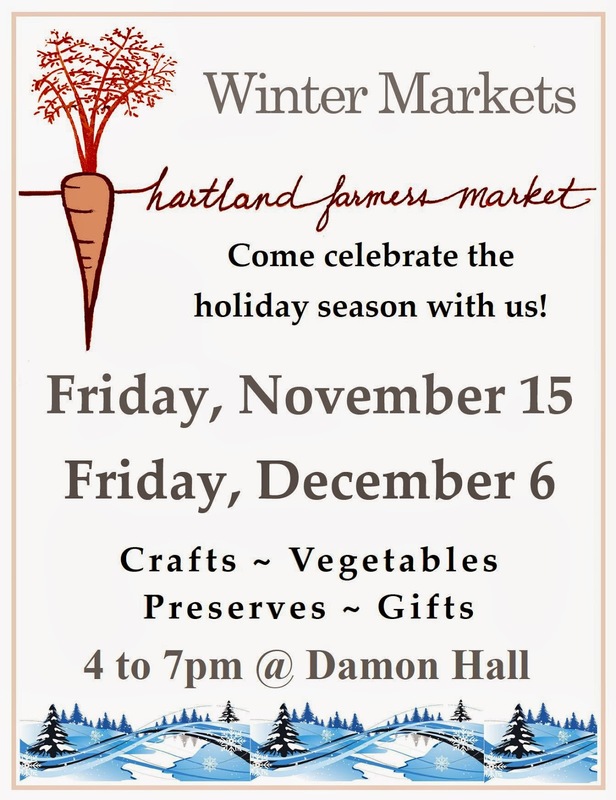 Want to see what our new crop of winter vendors have to offer?Join us for our first winter market, Nov 15th. And enjoy lively musical entertainment from a group of young local fiddlers. Shae Leigh's Country Canning: Specializing in homemade jams, jellies, pickles, and other canned items as well as maple products, and baked goods. 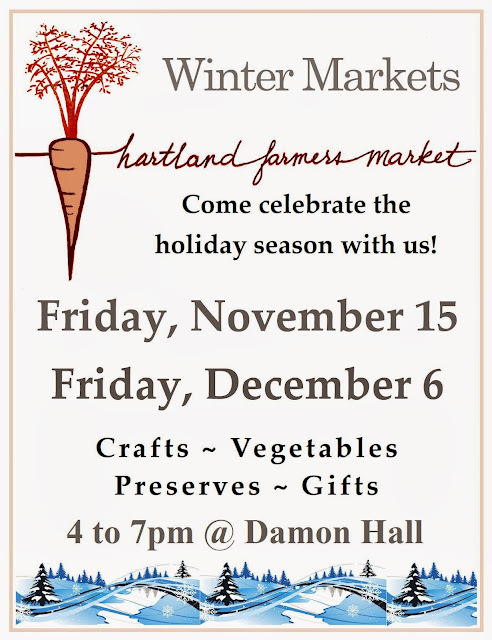 On behalf of the Hartland Farmers' Market and all our vendors, I want to thank everyone for your support this season. Have a great fall season, see you at the market. Don't forget our Fall Festival this Friday night! 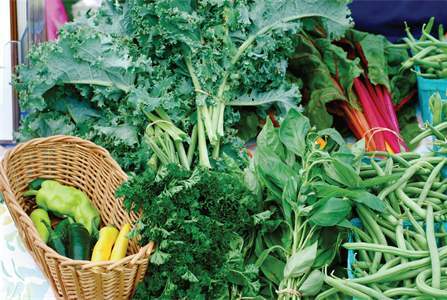 Important information from Vermont Farmers' Market Association (VTFMA) for WIC participants. Farm to Family coupons for WIC families may still be available at your local Department of Health office. If you have not yet received coupons or have multiple eligible people in your household, you may still be able to get coupons. The Farm to Family coupon program helps you buy locally-grown fresh fruits and vegetables at 62 participating farmers markets around the state. Coupons are distributed through September 30th, 2013 and can be redeemed until October 31st, 2013. Please visit www.healthvermont.gov or call 1-800-649-4357 to find out if there are still coupons available at your district office and if you are eligible. Featuring music from Peter Concilio, activities for the whole family, and delicious fall foods. See you at the last market of the season. We had a great evening down at the market. The weather was gorgeous, the kids had fun, and vendors had lots to offer. Play dough making + tie dying + face painting = tons of fun! Check out our Sept. 6th photo album on Facebook. 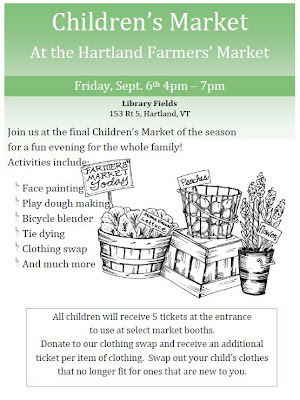 Don't miss it... the final Children's Market of the season is tomorrow night! Swing by the market for fresh foods, handmade crafts, and of course, fun activities for the kids including tie dying and make your own play dough. Got something white at home that needs a little color? Bring it down and tie dye it, or buy one of our kids market T-shirts or market bags for $6 to tie dye. Bring items to donate to our Children's Clothing Swap and perhaps leave with something new to you. All remaining clothing at the end of the evening will be donated to the Upper Valley Haven. There is so much going on at the market in September, don't miss out. There are four markets left and some big events coming up in September such as our Children's Market on Sept. 6th an evening of fun activities for the kids. And be sure not to miss our Fall Festival on Sept. 20th. Come out an enjoy an evening of fall activities and music from Peter Concilio, and buy those great fall treats we look forward to all year like pumpkins and squash, or apple cider. School is back in session, summer is coming to a close but the Hartland Farmers' Market is still open for another month. We've been enjoying beautiful weather for the past few weeks and vendors booths are looking great. Take a look at all of the great produce available. Need corn or tomatoes? We've got you covered! This week, swing by the Hartland Farmers' Market and pick up sweet corn for dinner, or try one of the many heirloom varieties of tomatoes offered by Oak Wood Farm: they are grown from local seeds. This week, support Hartland Farm to School and purchase fresh herbs grown by Hartland Kidz Klub. It's all right here at the market. This week at the market..... Tomatoes and Corn! Yes that. 's right, for those of you who have been waiting all summer long for them, Oak Wood Farm finally has TOMATOES ready for market! Come and get locally grown tomatoes from right here in Hartland. And what goes great with tomatoes? Basil! Come down and support Hartland Farm to School and Rec Department by purchasing fresh herbs, including basil, tended by the Hartland Kidz Klub this summer. And just in, there will also be CORN for sale! Summer's bounty is really here, this is the best time of year for those who enjoy the taste of fresh foods. Plus, don't miss out on all the other great prepared food and craft items for sale at the market this week from Oak Wood Farm, Contented Butterfly Farm, Nada's Notes, J + A Crafts, Shae Leigh Country Canning, Green Mountain Flour, Kids Books and Parents Books, Heaven and Earth, Bags by Barb, and joining us for the first time this season, Hangups, offering appliqued wall hangings. Its all right here at the market. See you there. This Friday at the market, stop by to pick up all the produce you'll need for the week. Have you heard about Amaranth? It is a Super Food, high in essential vitamins and proteins. Oak Wood Farm may be one of the only suppliers of locally grown amaranth here in Vermont. Get it at our market! We had so much fun at the Children's Market on Friday, Aug 2nd. The weather was beautiful. The entire Hartland Kidz Klub showed up for face painting and salsa making on the blender bike. I know some people went home with some great tie dyed market T-Shirts. I was so busy painting faces that I hardly had a chance to look around me. I hope everyone had fun. Thanks for coming out. Here are a few snap shots. This past week we had great weather for the market. Hartland Farm to School was helping to sell fresh cut herbs grown by the Hartland Farm to School and the Hartland Kidz Klub. And a brand new vendor showed up out of the blue with totally entertaining and awesome hand painted magnet art. It is fun for kids of all ages. Whether you are taking a car ride, sitting in an office, or standing at your refrigerator you will be entertained. Plus, they are beautiful. It just goes to show, you never know what awaits you at the market. Can't wait for this week's Children's Market. Its going to be a good one! We are going to be tie dying so bring your white or buy our market T-shirt. Get ready for salsa making, slip and slide, and more! And don't forget to bring used kids clothes to donate to our Children's Clothing Swap. Go home with some great clothes that are brand new to you. Its all right here at the market. What's going on at the Market? Summer is in high gear and gardens and farms are producing boat loads of great produce. Don't miss your chance to get your hands on local food straight from the people who grew it. That's a long list of great things to eat. Also, we'll have Hartland Farm to School at the Community Booth helping to raise awareness and appreciation for our great vendors and farmers' markets state wide. 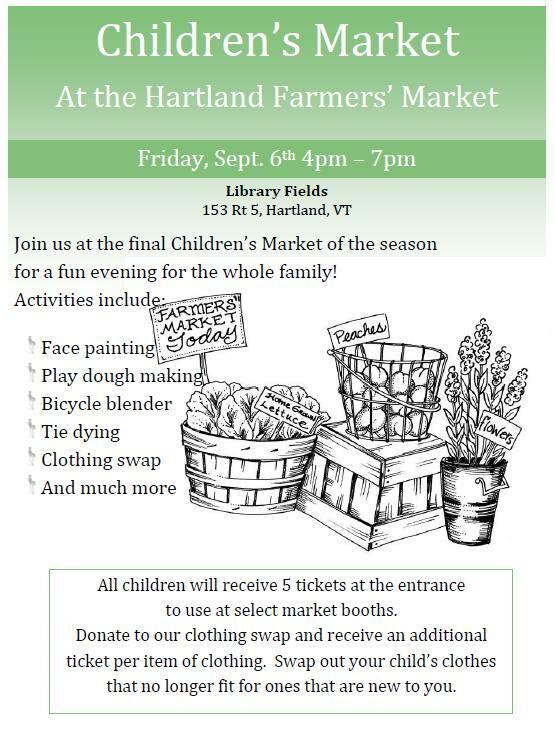 Plus, support local youth gardeners and purchase a bundle of fresh cut herbs from the Hartland School Garden and the Children's Garden at the Hartland Community Garden! Last but not least, at the market this week, you can pick up dessert from Batter Desserts, fresh baked bread from Green Mountain Flour, and a variety of eggs from duck eggs to rainbow eggs to jumbos. Its all right here at the market. See you there! This week, beat the heat with a trip to our market. Don't feel like cooking? You can make a delicious, healthy dinner with offerings from our market without turning on the oven. Pick up a loaf of oven baked bread and pesto from Green Mountain Flour. Pair it with a salad of field fresh greens and green beans from Oak Wood Farm. Take home a tasty pastry for dessert from Shae Leigh Country Canning and while your visiting check out their deals on pickles and preserves. Or eat dessert before dinner and cool off with one of Shae Leigh Country Canning's ice cold sorbet. Looking for a good summer read for yourself or the kids? Stop by Kids Books and Parents Books to browse the selection of used books or DVDs. 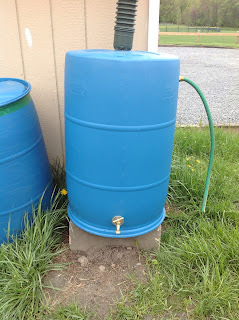 Finish off your trip to the market with a stop by the Community Booth to learn how to build your very own rain barrel. 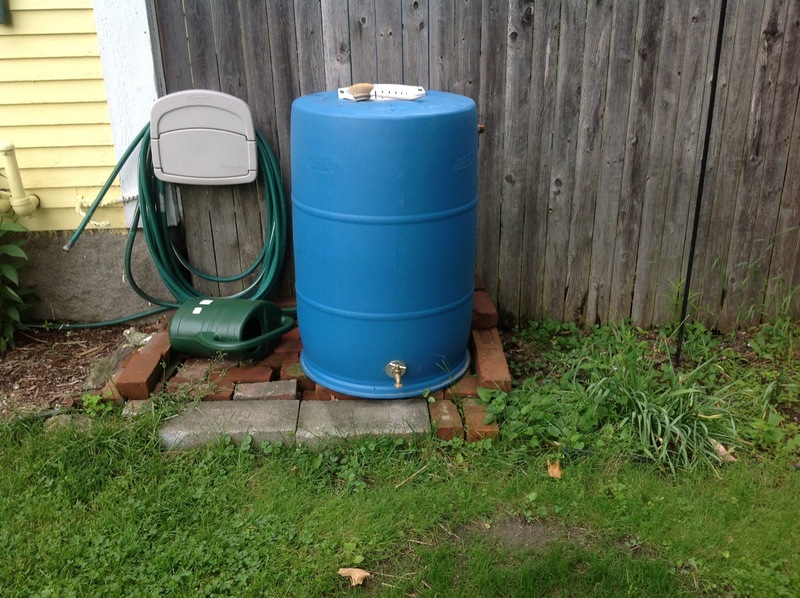 Have you ever wanted to make your own rain barrel to collect water? Interested in learning? 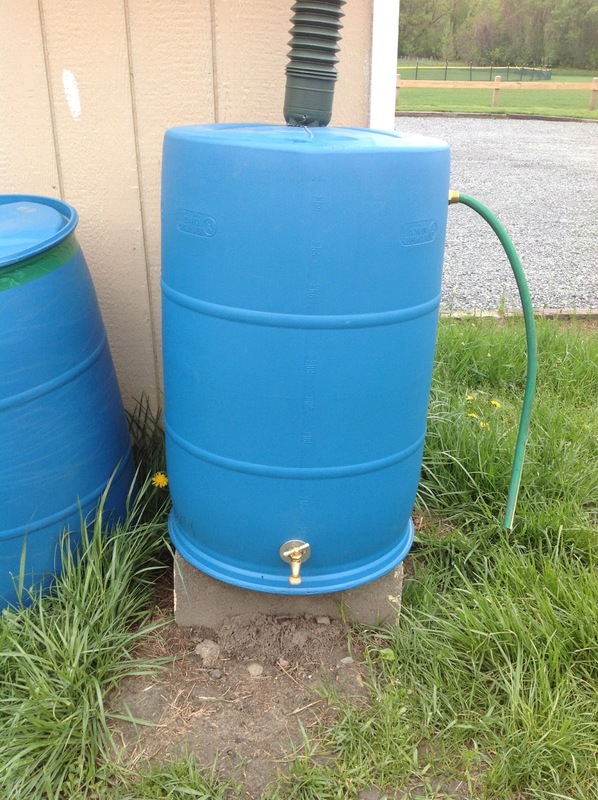 This week at the market you can learn how to make your very own rain barrel. You'll be able to talk to someone who has done it before and see a finished product. We will have tools, instructions, and photos for you to learn from. You will know everything you need to in order to get started on your won rain barrel project. The only thing left will be for you to get your hands on a barrel. Its all right here at the Hartland Farmers' Market. This week, swing by the market for some fresh dinner ingredients or pack a picnic and plan on dessert from the market. Don't forget the Library's showing of Les Miserables (2012) version at 7:00.
and who says you can't have dessert before dinner? Don't forget our talented craft vendors too. Its all right here at the market. Thanks everyone who came out to help us kick off our first ever Children's Market. It was a great success, lots of fun things going on, delicious food, and a great turnout at the market. We will definitely do it again. Here are a few pictures but check out our Facebook page to see the whole album. This week at the market swing by to pick up some weekly produce or stay for a while and enjoy fun for the whole family at the Children's Market. Oak Wood Farm's pea shoots, they a delicious, I've been eating them in all my salads. And don't forget about all of the special kids activities that will be going on too at the Children's Market. All children will receive 5 tickets upon arrival to use at our Children's Market. Bring you child's outgrown clothing to swap for something "new to you" and receive one ticket for use at the children's market per article of clothing. At the market this Friday we are holding our first ever CHILDREN'S MARKET at the Hartland Farmers' Market. There will be crafts, games, and face painting for kids, smoothie making with a bicycle, and much more! Stay for dinner and grab a fresh oven fired pizza from Green Mountain Flour. Look for other special offerings from vendors as well. We are also running a children's clothing swap so bring those out grown clothes and swap them for new ones. Click the link on the left side of the page to see our event flyer. Its all right here, at the Hartland Farmers' Market, this week, July 5th from 4pm - 7pm at the Library Fields, Rt. 5, Hartland. Weather right now is pretty terrible but the forecast is for clearing later in the day. Our policy is that we will hold the market in the rain however we will cancel if there is severe weather. As of now the market will still be going on, we won't let a little rain stop us! Keep checking for updates. It has been a rainy and stormy week and I know they are predicting more to come but I've ordered up a dose of sunshine for tomorrows market, so keep your fingers crossed for good weather. However even if the weather doesn't cooperate we will still be there for those of you who want to brave the rain. We've got a great line up of vendors for this week's market. Do you have kids who have read every book in the house? We've got a book vendor selling used children's books along with books for grown ups too. Grab some fresh ingredients to take home for a healthy, straight from the field, dinner from Oak Wood Farm or Contented Butterfly Farm. Missing something from your herb or kitchen garden? This week we will have a vendor selling potted herbs and flowers so you can grow your own and have them at your fingertips when cooking. This week is the first week that VT Farm to Family coupons are being distributed. They are good for use on fresh fruits and veggies. We have several vendors who can accept the coupons. So come redeem those coupons at our market. Hope everyone had a great weekend with all of the great things going on in town like the garden workshop at the Hartland Community Garden, the market, and the Library's showing of Disney's Mulan all on Friday night, and of course the Jazz Fest on Saturday. Thanks to all those who stopped by the market. I had a great time doing the "Dinner Demo" of Spring Greens Rolls. I think all who tasted them can agree that they were really yummy, and best of all everyone got to make the rolls themselves. The pea shoots and kale supplied by Oak Wood Farm were great fillings for the rolls and the fresh mint and basil from Contented Butterfly Farm added just the right flavoring. We will be continuing to do Dinner Demos throughout the summer so don't worry if you missed this one, there will be more. June has been a busy month but things are just getting going. Pretty soon our produce vendors will be coming to the market loaded will lots of field fresh veggies and fruits. Green Mountain Flour will also be bringing their pizza oven to market once summer really gets underway so keep your eyes out for announcements about that. Shae Leigh Country Canning will have homemade sorbet throughout the summer and delicious sweets and drinks. Not to mention all of the other great things vendors are bringing to market. We are also planning special events at the market so get ready for a summer of fun, family, friends, and of course fresh produce at your local farmers' market. What to do with all these spring greens? Overwhelmed by all the delicious spring greens available this time of year like kale, and pea shoots? This Friday, come learn to make Spring Greens Rolls. Stop by the Community Booth for the first of a new series we are trying out called Dinner Demos. These cooking demonstrations will feature a fun, easy way to use produce available from vendors in a tasty dinner you can make yourself. 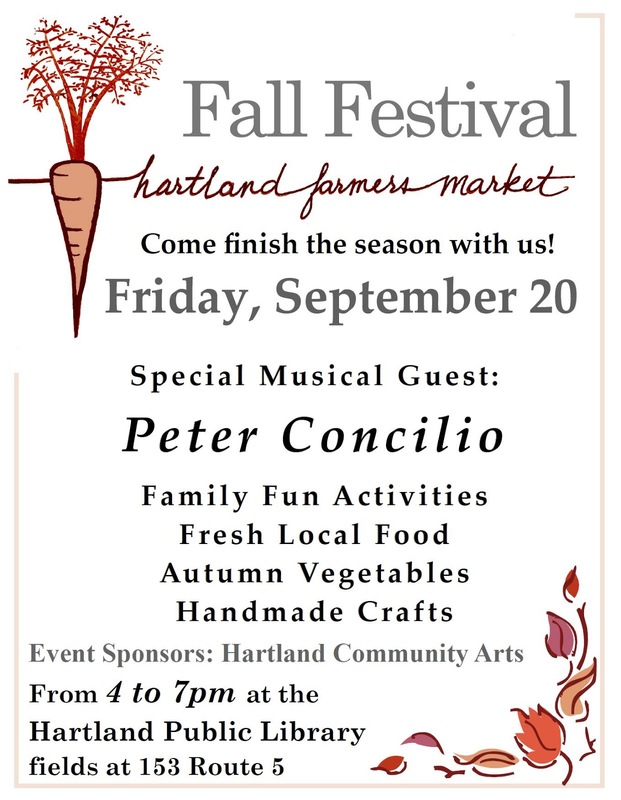 And don't forget all of the other great events going on in Hartland this weekend. Friday at 7pm the Library will be showing Dinsey's Mulan in the Community Room and Saturday don't miss an afternoon of jazz at the Hartland JazzFest hosted by our sponsor Hartland Community Arts. Music begins at 1pm. Get ready for a great weekend. Come on out and support your community. First, visit the market and pick up fresh vegetables or herbs like mint, chives, kale, pea shoots, rhubarb, and so much more. Browse the selection of beautiful handmade crafts and grab a snack like a delicious loaf of bread and pesto. Bring a picnic dinner and eat right on the field or at one of our market picnic tables. Finally, at 7pm, enjoy the Library’s showing of the Disney movie Mulan inside the Community Room. It’s all right here, starting Friday at 4pm. Thanks everyone who came out to help us kick off the market season. Our new market layout helped create a special atmosphere and the weather was beautiful! We added a few new vendors to our official list, be sure to click on the links on the left side bar to find out more about what our vendors are offering this summer. Here are a few pictures from this evening. Visit our Facebook page to see the entire album of pictures from tonight. 1st market of the summer in two days! Get ready and get excited for this summer's crop of vendors, some new, some returning. Buy early season produce from Contented Butterfly Farm or Oak Wood Farm and browse for a great last minute gift for Dad from one of our talented craft vendors like a whirligig or birdhouse from J+A Crafts. This week at the Community Booth, one of our market sponsors, Hartland Community Arts, will be promoting the upcoming Jazz Fest held right here in Hartland on Sat, June 22nd. A great evening awaits you at the market this Friday. See you then. Farm Fest was so much fun! The weather cooperated, except for the occasional gust of wind that wanted to blow everything off tables, the food was delicious, and people had a great time. I got to meet and talk to so many people, thanks to everyone who stopped by to chat. In other news, we've added more vendors to our list. Shae Leigh Country Canning will be at the market all summer with delicious preserves. We've added a used book vendor, Kids Books and Parents Books, so get ready for summer reading and Heaven and Earth crafts, making pieced table runners, Kindle covers, lunch bags, beaded book marks, and so much more will be joining the market. The Potlicker Kitchen will be turning up throughout the season with tasty items for sale, so get excited! We've been working hard on our website, getting the most up to date, accurate information posted for both our vendors and our sponsors. You can click on the links to learn more about what these great vendors and local businesses and organizations have to offer. And don't forget to stop by the market this Friday night for our opening market of the season! Stop by the Farmers' Market booth at Hartland Farm Fest today. We'll be doing crafts for kids, we'll have my homemade blueberry jam and hot pepper jelly while it lasts, and I'll have vendor applications and information about the VT Farm to Family program. Beautiful weather today so come on out! Get excited everyone. Only one week until our market opens for the season. You’re invited next week to help us kick off our market season at the first market of the summer from 4pm – 7pm at the Library Fields. Reconnect with your favorite vendors and meet new ones, check out what products are being offered this summer, buy fresh ingredients to take home for dinner, or grab a bite to eat and enjoy an evening outdoors. It’s all right here. The market is also still accepting applications for produce vendors. Did you start plants from seed this spring and now have more than you need? Do you garden that always produces more than you can eat? Consider becoming a part-time market vendor, you can come once or come as often as you want. For just $15.00 per market, you can share your bounty with your neighbors and make some extra cash. Find out more information about vending under our resources section or contact Sarah Sincerbeaux, the market manager at hartlandfarmersmarket@gmail.com or by phone at (339) 222- 1072. We had a great turnout for the Vendor meeting last Friday night. The weather cooperated and we were able to meet outside on the Library Fields. We even set up a tent. It was my practice run for what I will be doing all summer, putting up tents every Friday afternoon for the market. There were many familiar faces at the meeting. I'm happy to announce that Brian Stroffolino from Oak Wood Farm and Jennifer Cary from Contented Butterfly Farm, both will be full season vendors this summer. Welcome back to those two produce vendors. There were also several new vendors in attendance including Anelyce Forney, a baker making delicious treats, and yes, they are gluten free! She will be attending the market a couple times a month so look for announcements for Batter Desserts and come try one of her mint chocolate chip or chocolate and peanut butter cupcakes. My mouth is already watering. It is hard to believe how quickly spring has flown by. Summer is nearly hear and the first market of the season is less than a month away. Yes, that's right, first market of the summer is in less than a month so mark your calendars. I'll see you at the market. Vendor applications are coming in. J + A Crafts and Nada's Notes and Photos will be returning for yet another season! We want to wish a big welcome back Green Mountain Flour too! Can't wait to meet all the vendors at our vendor meeting this Friday, the 17th, at 4:00 at the Hartland Public Library. I am looking forward to warm summer evenings and great company at the market. Hartland Farmers Market is pleased to announce a new market manager for the 2013 season. Sarah Sincerbeaux is an environmental studies graduate student at Antioch, who is very interested in farming and local food networks. She has enjoyed visiting our market in previous seasons and looks forward to working on our upcoming season. We are in the process of building up our vendor list, if you have thought about selling at our market in the past, please contact us. We have Full Season (15 Fridays), and One Market fee plans, as well as a 10% fee booth for someone wishing to test out the market. We also encourage small vendors to find someone to share a booth space with, to help increase vendors and variety at the market. Our market promotion is being changed this year, so that it will include the calendars and notices that have been done in the past, as well as information cards at new locations. If you have suggestions for places that we have missed in the past please let us know.